According to Bubba in the film Forrest Gump, “shrimp is the fruit of the sea”. He then lists all the different ways you can eat shrimp – shrimp soup, shrimp stew, shrimp burger, shrimp sandwich… you get the picture. If shrimp is the fruit of the sea in Alabama, then watercress is the fruit of the river here in Hampshire. 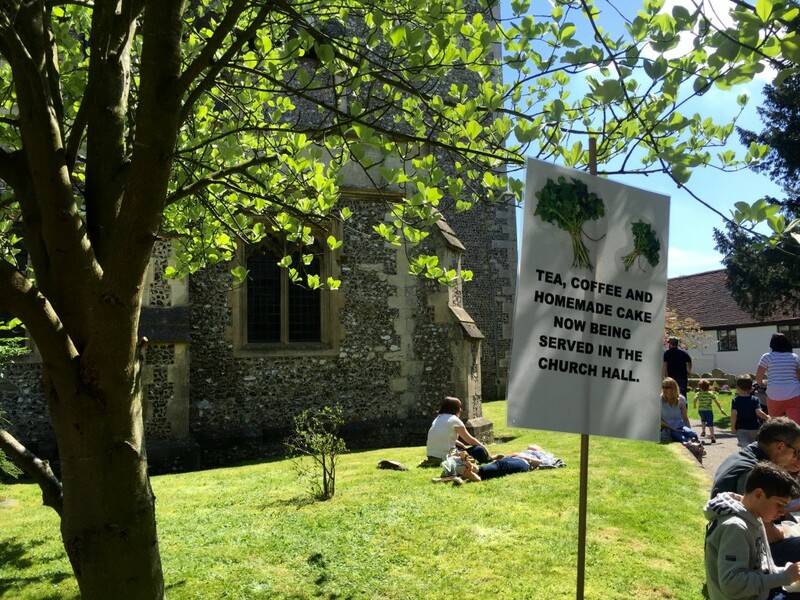 I can say this after discovering a multitude of uses for watercress on my visit to Alresford’s annual Watercress Festival on Sunday. See, watercress isn’t only a delicious raw as an accompaniment to meat and fish. It’s a handy ingredient in things like bread, scones, muffins, beer, sausages and burgers too. Actually, watercress can go in just about anything. The entrants into the festival’s competition for “most creative/interesting/mind-blowingly awesome use of watercress” demonstrated this. Mummy Makes Fudge’s watercress and chorizo fudge was a particularly daring concoction, I thought. We arrived at the festival, which celebrates the beginning of the watercress season in Hampshire, around midday. A couple of hours earlier, a procession of jazz musicians and morris dancers accompanied the Watercress King and Queen through the centre of this Georgian town centre to signal the start of the festival. We’d parked on the edge of the Alresford so we could work up and appetite and soak up the atmosphere on the short walk down into the town. Revellers could also park in one of two official car parks for a small charge or use the park and ride – a short trip on the Watercress Line heritage railway from nearby Ropley. 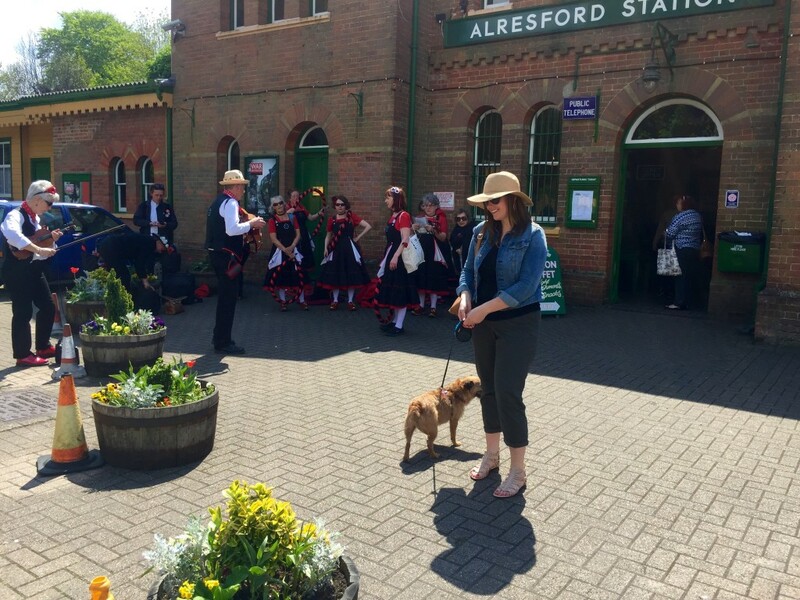 After we caught the end of a morris dance at the train station, we made our way down Station Road to the festival proper. 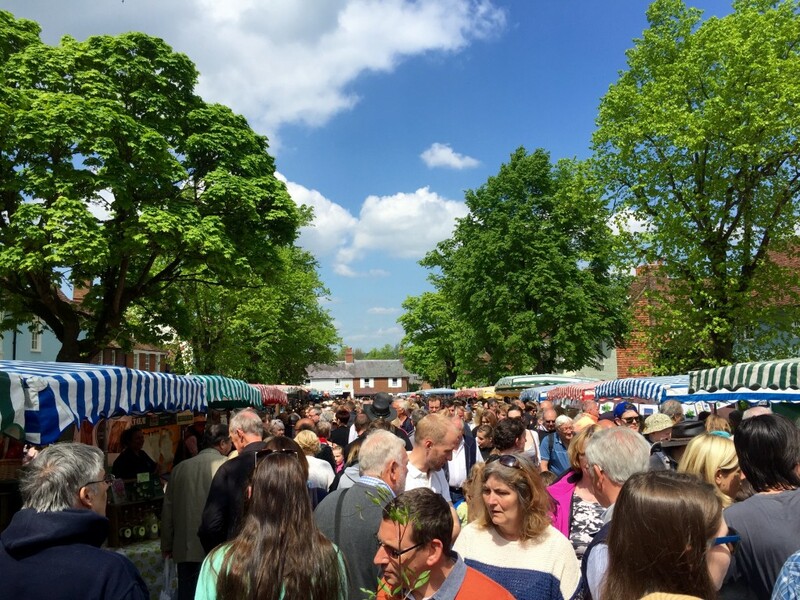 The streets were packed with people enjoying the spring sunshine and browsing the stalls that lined the edges of the road. Many local shops had also opened their doors, so there was plenty to see. 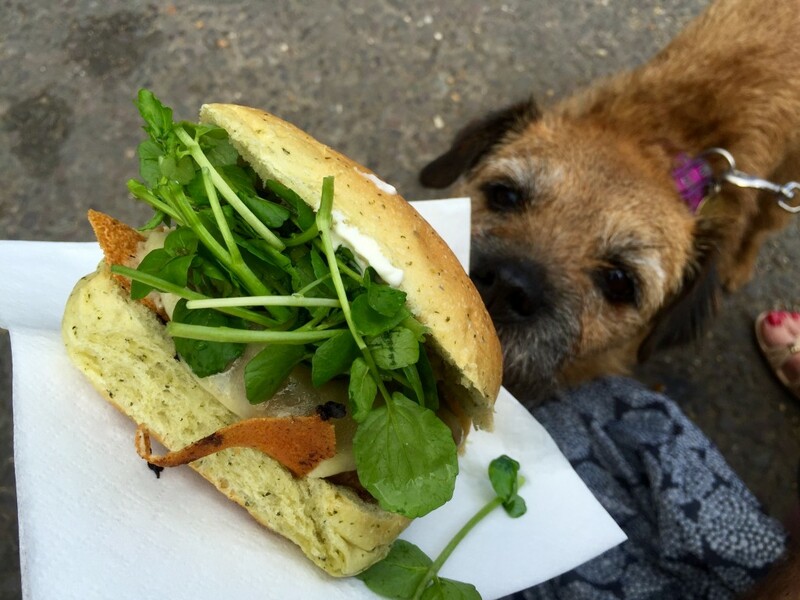 We browsed the stalls and shops along East Street first and shared a cheesy treat from Heidi’s Patisserie. The stalls offered a mix of crafts, clothing and gourmet food. 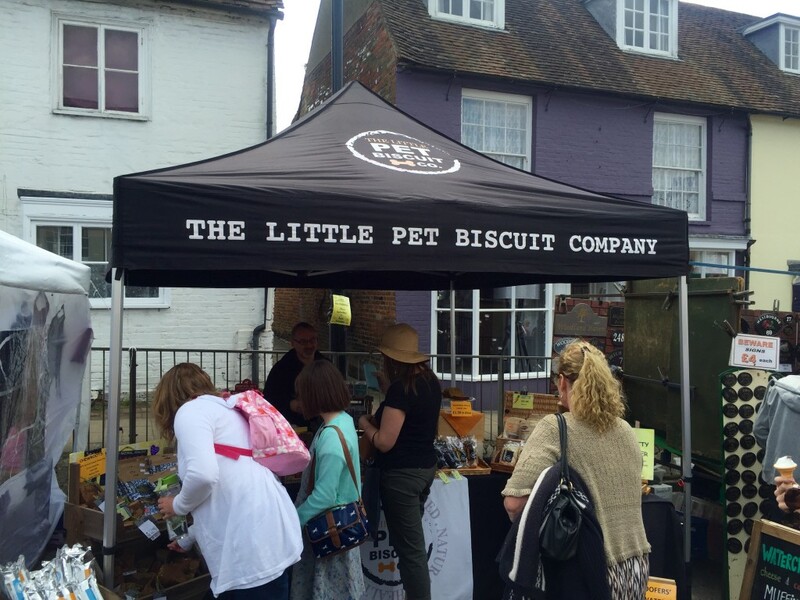 There were also a few local companies and charities promoting their services. My first brush with watercress was at the Winchester Distillery stand where I sampled their famous Twisted Nose watercress gin, something I’ve enjoyed before in chocolate form at Chococco. I’m no gin enthusiast, but I reckon I could be tempted by this one mixed with a decent tonic water. 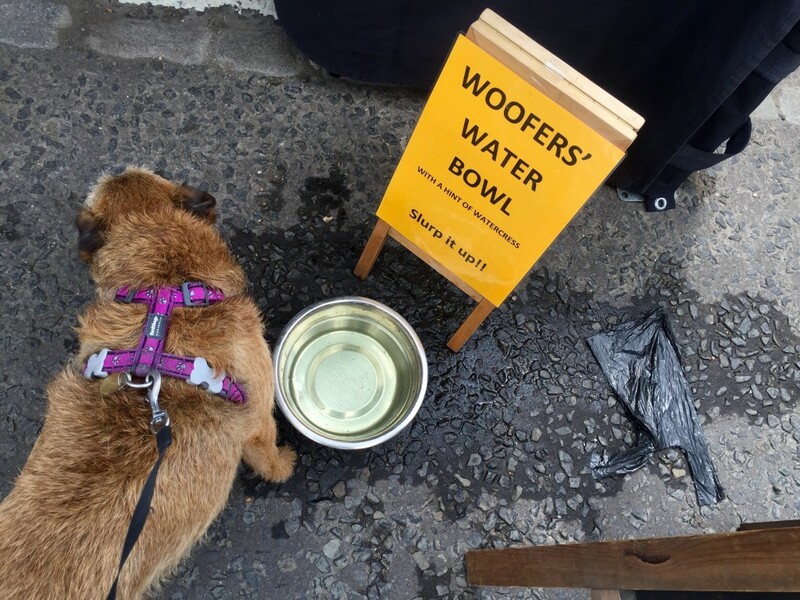 It wasn’t only us humans who got to enjoy some watercress in our beverages – the Little Pet Biscuit Company stand’s water bowl for dogs included watercress too. Tilly, thirsty from straining at the lead in search of scraps of food, lapped up the green-tinged water with gusto. 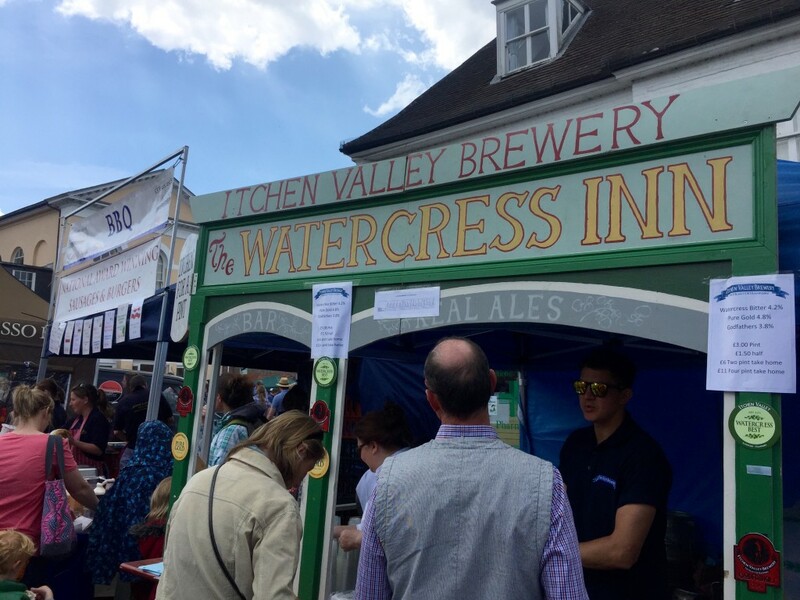 As we headed up towards the junction with Broad Street, we passed more and more people grasping plastic cups of beer and cider and it wasn’t long until I spotted Itchen Brewery‘s pop-up bar “The Watercress Inn” through the throng. I tried their “Watercress Best” ale (4.2%) at last year’s Southampton Beer Festival and I was glad to see it again here. I promptly ordered half a pint to sip on as we explored the rest of the attractions. 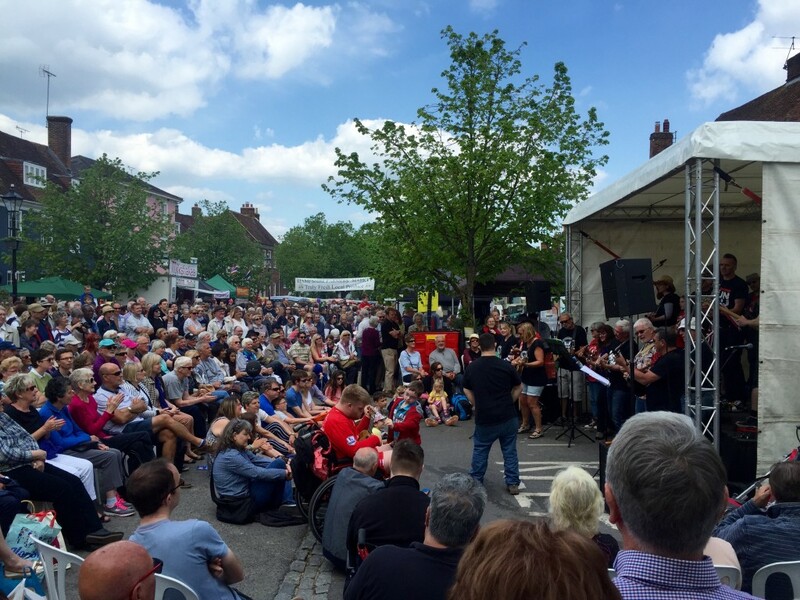 At the stage set up a little way down the street, the Southampton Ukulele Jam were entertaining the crowd with an eclectic mix of covers including The Killers’ “Mr Brightside” and Oasis’s “Champagne Supernova”. Other acts to perform here throughout the day included Goldalming Brass and the Sussex Jazz Kings. There was more music and artistry happening in different parts of the town throughout the day, too. Meanwhile, fun things like circus skills workshops, falconry displays and a petting farm kept the kids entertained. 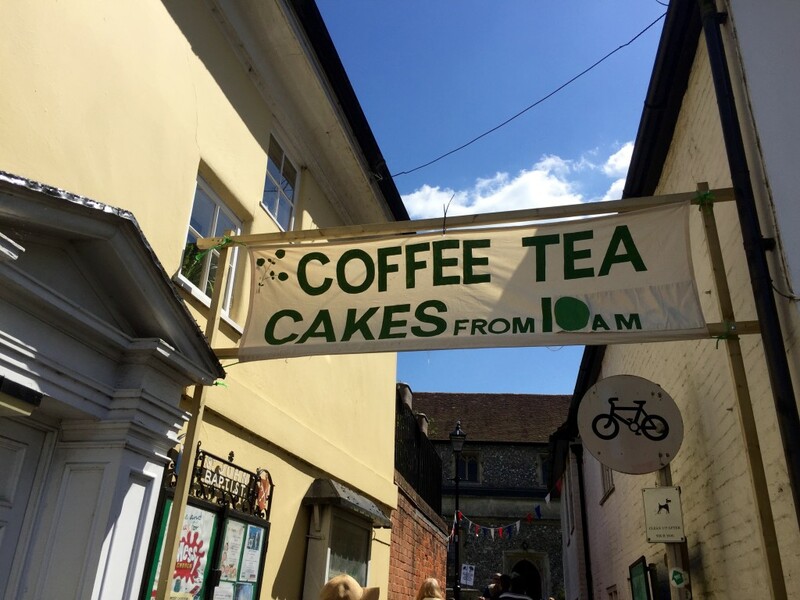 The bottom half of Broad Street was dedicated to more than 40 Hampshire Farmers Markets members’ stalls. 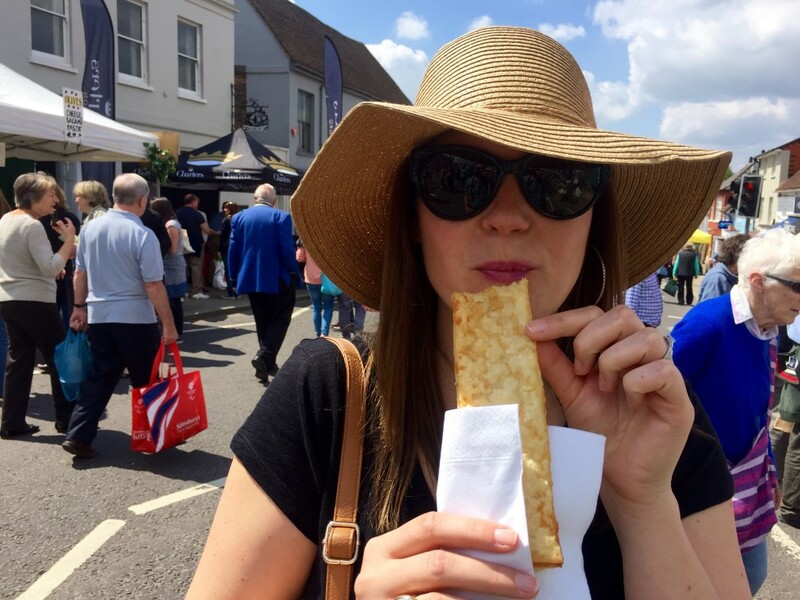 These markets, which happen on Saturdays and Sundays at various locations throughout Hampshire, promote products and produce grown or reared either in Hampshire or within 20 miles of its borders. There was more watercress-themed foods here. I spotted watercress sausages, watercress bread and cured meats flavoured with watercress as we pushed through the crowd. 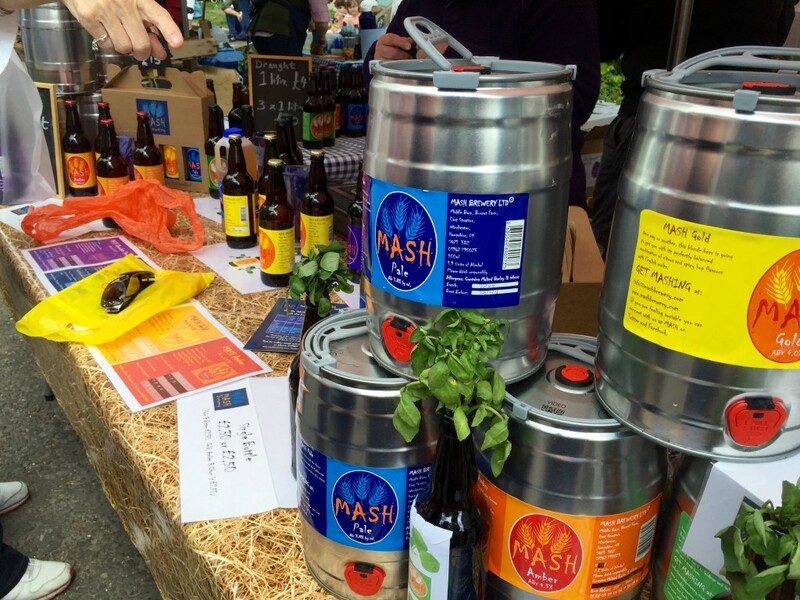 I also spotted two more stalls selling ale straight from the cask. My “Pale” (3.8%) from the Mash Brewery and “Winchester Pale Ale” (4.5%) from Alfred’s Brewery both went down a treat. Like last week’s visit to the Red Cat Brewery open day, I enjoyed a Broughton Water Buffalo burger with my beer. My burger was in a watercress bun with a watercress garnish, obviously. I also helped myself to a dollop of wasabi mayo to give my burger a little extra kick. We then watched a cookery demonstration by Daniel Chirita & Shunji Irokawa from Kyoto Kitchen as we ate our burgers. We got to sample the finished dish too – sea bream sashimi with watercress pesto. On our way back up the hill we picked up a small bag of watercress to eat for our tea in exchange for a small donation to charity. Well, we couldn’t really go home without any, could we? One group who probably couldn’t have faced watercress for their tea today were the contestants in the watercress eating championships. Their challenge was to much through two 80g bags of watercress (it’s much harder than it sounds) as quickly as possible. Unfortunately we’d foolishly left by the time this got underway at 3pm. Glen Walsh, the reigning champion and winner for the last four years, came out on top yet again. He devoured it all in one minute 37 seconds. We made our way back to the car through the pretty St John’s churchyard. Here, lots of people were relaxing among the blossom with cups or tea and slices cake from the church hall. I didn’t spot any watercress though. Maybe I wasn’t looking hard enough? Of course, there’s a semi-serious side to today’s festivities, which is backed by the Watercress Association. After all, this peppery plant is important to the local economy as many of the country’s biggest producers are based in and around Alresford. In fact, with just 150 acres of commercial watercress beds left in the UK at the turn of the century – down from more than 1,000 acres in the 1940s – watercress farming was in danger of dying out. 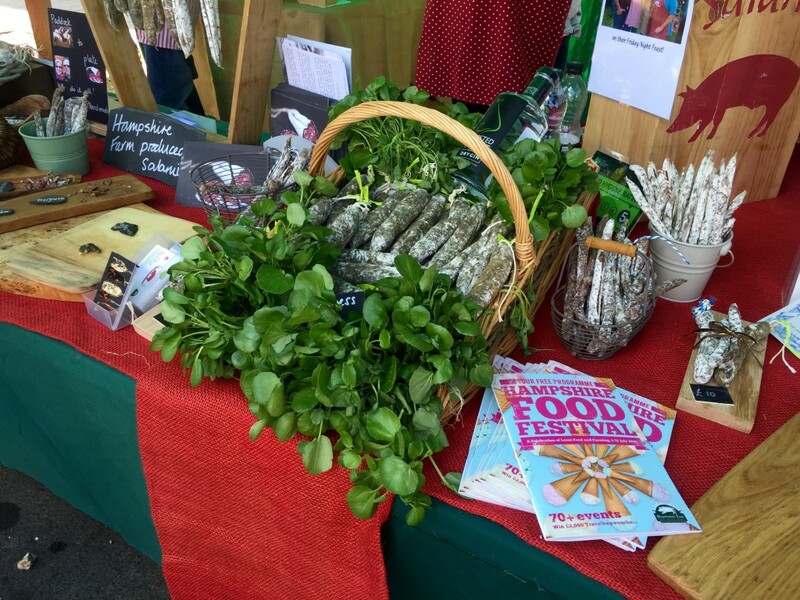 Thanks to events like the Watercress Festival and promotional campaigns that highlight the health benefits of the plant (it’s chock-full of 15 minerals and vitamins don’t you know), watercress is finding its way back onto greengrocers’ shelves and into our hearts – literally. If anything, today proved that watercress is an incredibly versatile ingredient. Yet, it’s a shame to hide it away in other foods. That said, I wouldn’t say no to another one of those watercress ales right now. Cheers! 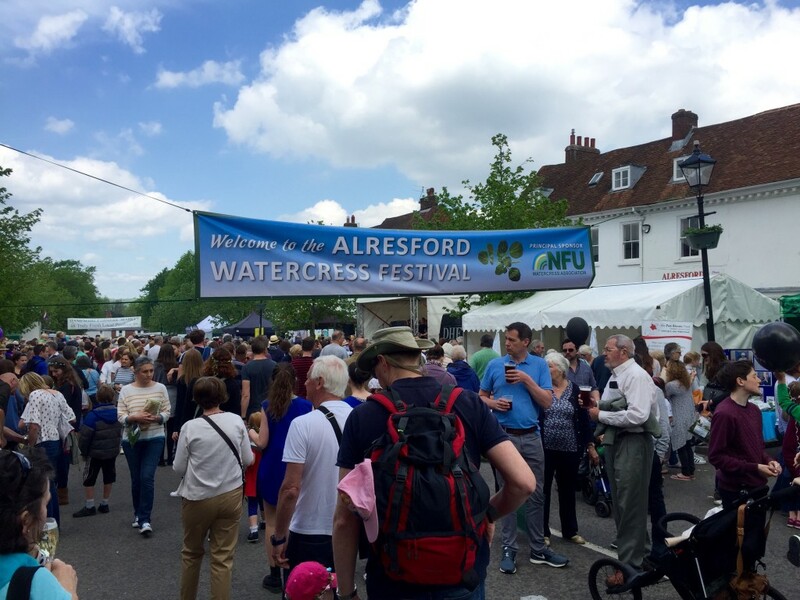 Info: The Watercress Festival takes place in Alresford on the third Sunday in May every year.